The 30.78 metre motor yacht Nirvana has been listed for sale by Giulio Riggio at Fraser Yachts. Built in GRP by UAE yard Gulf Craft to RINA class, she was delivered in 2008 as one of the yard’s Majesty Yachts range. Accommodation is for 10 guests in five cabins consisting of a main-deck VIP suite with a master suite, a double and two twins below, all with entertainment centres, Sony television screens and en-suite bathroom facilities. 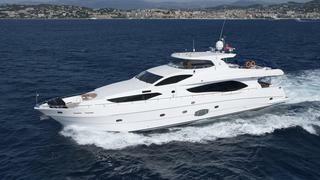 In addition, six crew are accommodated in three cabins aboard this yacht for sale. The open-plan main saloon has joinery and comfortable seating in fine mahogany woods and there is an entertainment centre including a 42-inch Sony flatscreen television and a Bose stereo surround sound system. Forward is a formal dining area seating 10 guests along with buffet cabinets storing glassware, china and cutlery. The large aft deck is shaded by the sun deck above and offers built-in upholstered seating, a table and chairs, offering the perfect venue for guests to enjoy an al fresco drink and a light meal. Up on the sun deck there is further room for entertainment and relaxation with built-in seating, tables, a bar and a barbecue grill. Twin 1,800hp Caterpillar diesel engines power her planing hull to a maximum speed of 27 knots and she is fitted with Trac digital fin zero speed stabilisers. Lying in Palma de Mallorca, Spain, Nirvana is asking $3,250,000.